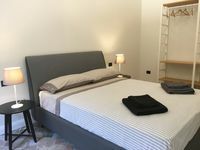 Property 5: Superior Apartment in Monte Urpinu city park .Modern, cozy, new. Property 15: Jungle Suite, design loft with garden in the city center. Property 24: Beautiful new penthouse with a breathtaking and unique view of Cagliari. Property 37: Cozy and colorful apartment 700 meters from the sea for up to 5 people. Property 40: Cosy & comfortable apartment in Cagliari, with parking space. Property 48: Apartment with large porch near the sea.